Accra, Dec. 9, GNA - Professor Emmanuel Gyimah-Boadi, Executive Director of the Ghana Centre for Democratic Development (CDD-Ghana), said on Thursday that the results of Election 2004 showed the polls were very competitive. The results so far put the incumbent New Patriotic Party (NPP) in the lead, but Prof Gyimah-Boadi said the ability of the main opposition National Democratic Congress to defeat some heavyweights of the NPP, including some Ministers of State, who had the capacity to award contracts, and better campaign resources in the race to Parliament made the election significant. Among the NPP candidates who lost the Parliamentary Election were Dr Kwaku Afriyie, Minister for Health (Sefwi Wiawso Constituency), Alhaji Mustapha Idris, Minister for Works and Housing (Tamale South) Mr Rashid Bawa, Minister of State in Charge of Education, Youth and Sports (Akan Constituency) and Mr Kwasi Owusu -Yeboah, Volta Regional Minister (Biakoye Constituency). Others include Mr Thomas Broni, Deputy Minister for the Interior (Asutifi South), Ms Elizabeth Ohene, Minister of State in Charge of Tertiary Education (Ho West Constituency) and Madam Hawa Yakubu (Bawku Central Constituency). Professor Gyimah-Boadi was speaking in an interview with the Ghana News Agency (GNA) in Accra on Thursday on the implication of the results so far on democratic governance for the next four years. He described the elections as highly competitive where both the overall losers and winners could come away with a lot of respectability and credit. He said the performance of the parties showed that Ghana had a natural two party systems be it the UP and the CPP, or the NPP and the NDC. "Judging by the performance of the parties that contested the polls, the possibility of a strong third party is very slim," Prof. Gyimah-Boadi said. He said the re-election of Mr Doe Adjaho (NDC Avenor Ave) and Mr Alban Bagbin (NDC Nadwoli West), and the entry of other NDC stalwarts like Mr Lee Ocran (NDC Jomoro) and Mr Haruna Iddrisu (NDC Tamale South) would reinforce the NDC as a very formidable opposition in Parliament. "That is the best news out of the election - you have a ruling party with a good working majority, but a minority that does not allow the ruling party to ride roughshod over the minority," Prof Gyimah Boadi said. He said there would be a substantial presence of the NDC in Parliament and that even though President Kufuor took a clear lead in the presidential polls, the NDC had come away with a respectable minority of the popular vote. "Anything close to 40 per cent is a substantial vote for the NDC," the CDD-Ghana Executive said. He added that such a margin was a clear mandate for re-elected President Kufuor not to ignore the preferences of the about 40 per cent of the Ghanaian electorate that would have liked to see Prof. Mills, the NDC Presidential Candidate as President of Ghana. On the survival of the NDC for the second time in opposition, Prof Gyimah- Boadi said it had to be assumed that the NDC had the resilience, structures and resourced for contesting elections. Time, he said, would tell, if the NDC would regain power, explaining that NPP was able to gain power despite speculations that it had died. "When a party has Parliamentary strength, the strength of the caucus gives the lease of life of that party. The NPP similarly benefited from the contribution of its members in Parliament when it was in opposition." Prof. Gyimah-Boadi noted that the NPP was made of self-made, but ambitious individuals, with the maintenance of unity difficult in such a group. He said some of the problems, which emerged at the Party's primaries could submerge the ambitions and well-being of the party. He observed that the inability of the NPP to successfully address personal ambition over those of the party, manage and resolve some of the conflicts at the primaries, which resulted in some candidates going solo, should be taken as sign for splinter groups, that could affect the unity of the party. He said very good competition within the party might produce the best persons but could leave the party very exhausted, adding that there was much to be worried about splinter groups in the NPP. 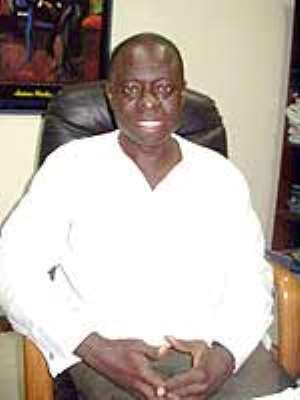 Though such a scenario looked far away, Prof Gyimah-Boadi said, it might be necessary for the NPP to consider and draw lessons from the acrimony that characterised the congress of the NDC and draw appropriate ways to fostering unity within the party, before it would go to congress to elect a new leader after President Kufuor. Professor Gyimah-Boadi said Ghana would make political and democratic progress if it continued to thread the path of transparent, clean elections whose results were not entirely predictable, and also if politicians abided by the rules of healthy competition, a vibrant media and an active civil society.